The Other Night at Quinn's is a post-modern love story between man, music, and the community he's discovered. Using a clever threading of cultural references and open minded listening, Faloon chronicles each step in venturing further and further down the rabbit hole. Throughout the book, he is a keen observer of not only the musicians on stage, but of the audience and their reactions, and the personalities that make it all happen. In short chapters, which themselves are composed of small vignettes, Faloon tells stories that connect the music that he grows to love and the scene that embraces him to the seasons, memories, and seemingly unconnected events that, even if they don't entirely dovetail, share deep common threads. Instead of delivering concert reviews - which have a certain amount of appeal - he presents patterns, textures, impressions, and pictures. In a later chapter, trombonist Steve Swell calls Faloon's writing "schizophrenic", in a very positive way: "when we play music or write poetry we are dealing with everything we already know or have been exposed to ... all of the information, disparate as it may seem, comes to the fore when we are creating". Taken as a whole, these piecies tell how a small dedicated group of people can create something whole out of disparate parts. This is true of many small (and not so small) places. It may be just one or two people who in their own quixotic ways create a place for the like-minded and curious on lookers to gather. For Beacon, it began with James Keepnews, who leveraged years worth of connections in the improvised music world with Quinn's restaurant, which was lucky enough to have an owner willing to give some often outlandish music a place to be. Each chapter in The Other Night at Quinn's is formed around, well, another night at Quinn's. The bands were not always known to Faloon, and he approaches each one with respect and openness, sometimes watching them interact, sometimes feeling the music, sometimes watching the audience. The set of characters is rich: trumpeter/saxophonist Joe McPhee is a recurring character, fleshed out as both a performer and an audience member (he lives nearby); Ingrid Laubrock and Tom Rainey perform sans sound system and in opposition to a birthday in the booths towards the rear; and the wild sounds of Katherine Young's Pretty Monsters and the blasphemy of a bassoon behaving nothing like a bassoon, just scratches the surface. The concert descriptions are juxtaposed with moments of the author's life - a poignant description of moving his mother into a smaller apartment as she became to old to care for her long-time home, or fragments of pop culture like the Inception-like reference to a Japanese movie that itself references the Coen brother's Fargo, or building a patio in his backyard and discovering a 1950's Buick buried below the ground. The humor is brittle, and it crumbles delectably around the musical and life stories. Faloon also drops in question-less interviews with the key figures and musicians without warning, which is surprising at first, but make sense within the framework Faloon has created. I am happy to say that I chanced upon this scene myself. I have always had a deep appreciation for this area, located just north of New York City, the hiking is fantastic, and the river is gorgeous, and the chance to experience avant-garde music amongst it was more than tempting. 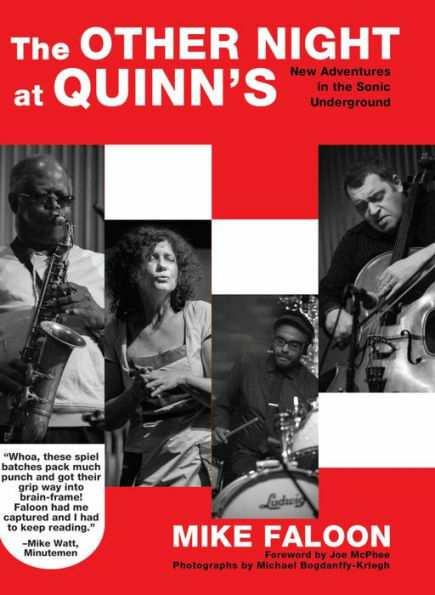 My first show at Quinn's was 'Son of Goldfinger' with David Torn, Tim Berne, and Ches Smith (Smith has a chapter in the book as well, a solo show. "Smith," Faloon writes, "concocts snare/bass combinations that pulverize, and the way he favors syncopation over speed allows you to savor each pop and punch.") and the last show I caught was a solo Eugene Chadbourne gobbling up the stage. My impression was that what was happening there was indeed something special, and Faloon confirms it. Things like this do not always last (though I hope this one does! ), scenes move on, venues change, and people come and go, but fortunately Faloon, in this physically small, but dimensionally thick book, captures not only a time and place, but a personal intersection with the world of creative music. It is his story and his community, but it's also the story of other communities, and of nearly anyone drawn who has been drawn into the vortex of improvised music. The Other Night at Quinn's: New Adventures In The Sonic Underground is available through Razorcake/Gorsky Press and I'd bet that if you venture to Beacon, you'll stumble upon a small crammed bookstore with a copy as well (but that's not a guarantee...just a feeling). Check out a chapter of the book here, "Another Candle on the Cake - Ingrid Laubrock and Tom Rainey".